My work is a vehicle to investigate the perceptual intimacy I find within public spaces. 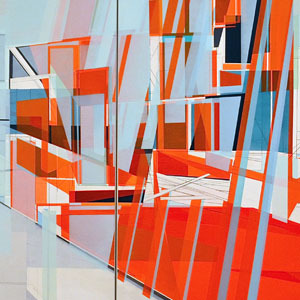 Blending contemporary with classical approaches to art and spatial relationships, I use the idea of perception as a function of human experience, place and personal memory. I explore how art can become a space by its interaction with the environment and how the space can become the artwork. Blending the philosophies of architecture with abstraction, architecture becomes both a visual and physical bridge between inside and out, a passageway of self-reflection, while abstraction is a way to move through a space. I explore compositional, personal and experiential connections while creating an invitation for the viewer to do the same. Conceptualizing ideas relating to place identity and lived experiences within the built environment, my large-scale paintings become an extension of my identity. The suggested architectural elements become a metaphoric voice, representing the temporality of my human condition, while teetering between the realms of public and private, intimacy and distance. I am interested in spatial relationships that capture an essence of a place, how we move through a space in the world and within a piece of art. My work explores whether, through art, we can share our individual perceptions, whether someone can access and experience a new view of the world through my artwork and how I can create a new space via my art.